Organizers from across the political spectrum are planning rallies to bring even more people into the streets in the second half of the month. Several Russian political and social forces are planning to hold public rallies in the second half of February in hopes of bringing more than 250,000 people into the streets of Moscow. The organizers of the “For Fair Elections” rallies are planning two events on the major road surrounding the center of Moscow known as the Garden Ring. The opposition group will host a protest of cars as well as a human chain. On the other end of the political spectrum, the supporters of Vladimir Putin are planning a march down the city’s main artery, Tverskaya Street, as are members of Russia’s three other major political parties. Another group unaffiliated with any political party is planning a meeting in the northeast of the city. Moscow City Hall has yet to approve the applications for any of the meetings; the city government has suggested that some of the meetings reduce the planned number of participants or change their planned locations. Public rallies are also scheduled for cities outside the Russian capital. The opposition movement For Fair Elections, which was created after the December State Duma vote, has decided to branch out from the traditional protest by foot and is calling for drivers across the country to bring their cars onto the streets on Feb. 19; the group organized a successful automobile protest on Moscow’s Garden Ring on Jan. 29. The protests will also be sponsored by the League of Voters and organized via social networking. Volunteers from 20 Russian cities, including St. Petersburg, Omsk, Yekaterinburg, Togliatti, Barnaul, Nizhny Novgorod, Samara, Volgograd and Kazan, are creating groups on Vkontakte and Facebook and calling on people to take part in the automobile protest by putting white symbols on their cars and driving in a circular route around their cities. Vladimir Putin’s campaign headquarters and the Russian Popular Front plan to attract 200,000 to a march and rally in the center of Moscow on Feb. 23, which is a public holiday. The group intends to march down Tverskaya Street from Tverskaya Zastava to Manezh Square, where they will hold a 90-minute rally. The application for the action has already been filed with City Hall but the authorities have yet to agree the proposed route and have proposed cutting the number of participants to 100,000 and holding the rally not on Manezh Square but on Poklonnaya Hill or at Luzhniki stadium. Dmitry Peskov, Prime Minister Vladimir Putin's press secretary, did not rule out the possibility that Putin might appear at the meeting. Just Russia has applied to hold a 2,000-person march from Manezh Square to Pushkin Square from 1 p.m. until 3 p.m. The Moscow authorities are planning to ask Just Russia to change the proposed location. The LDPR is going to hold its rally on Pushkin Square on and expects up to 2,500 people to turn up. The application has yet to be approved by the city. Moscow officials believe the LDPR should cut the number of participants to 1,500. In addition to conflicting with one another, the proposed locations for all these rallies also conflict with the route of the pro-Putin march. A group that is generally against a Western-leaning “color revolution” in Russia has planned a separate rally on Feb. 23 organized by the Essence of Time movement. Sergei Kurginyan, leader of the Essence of Time, said that some harsh criticism of the authorities will be heard, but the participants are firmly against any kind of revolutionary change in Russia. The organizers have applied for a permit for a 15,000-person rally and proposed several locations. The exact place will only be known after the Moscow authorities consider the application, but Kurginyan has not ruled out that the rally could be held at the All-Russian Exhibition Center (VVTs) in the city’s northeast. Last year, the group held a rally on Feb. 4 at Poklonnaya Hill that was markedly pro-Putin. According to the Interior Ministry, this rally attracted 140,000 people although the organizers had applied for only a 15,000-person meeting. The court imposed a fine of 1,000 rubles ($40) on the organizer, Nadezhda Korneyeva, deputy chairperson of the Patriots of Russia party, for exceeding the declared number of participants. Putin himself gave the money to pay the fine. A week before the presidential election, For Fair Elections is planning another non-traditional meeting – the creation of a human chain on the Garden Ring. Organizers think it will take 34,000 people to create what they are calling The Big White Circle. City authorities have said that the action would not require official sanction if it does not obstruct traffic and pedestrians. After the center of Moscow is surrounded by the human chain, the group is planning to move to Revolution Square to send off the political winter. The organizers will invite citizens to make small effigies of the ”Putin political winter” which, following the tradition of Russian Shrovetide (Maslenitsa), will be set on fire, said Sergei Udaltsov, a member of the organizing committee and coordinator of the Left Front. This rally will include speeches by leaders of the For Fair Elections movement. 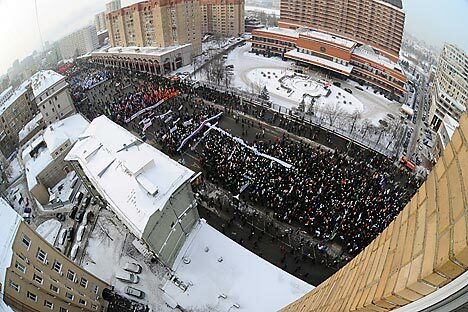 An application for a 1,000-strong rally was submitted to the Moscow authorities on Feb. 13. The data based on the figures from RIA Novosti. Click to enlarge.